How Much Does Laser Tattoo Removal Cost In Sydney? At Think Again Laser Clinic we use the world’s renowned Picosecond laser, firing photon beams at every 10-12 parts of a second, capable of lightening and completely removing tattoos across the entire colour spectrum. Quanta Discovery is a true best in class with 1.8GW of power, enables it to penetrate into the deepest parts of dermis skin layer, shattering even troublesome tattoo ink colour like green and light blue. Besides, it incorporates true three wavelength photon pulses without using handpiece diodes. Our Quanta Discovery Pico Plus Laser System utilizes The Squared Opti-Beam hand-piece technology, that ensures the laser energy is perfectly distributed over the target area and delivers the energy consistently, preventing any excessive overlap pulses. Not only do we provide our clients with the Gold Standard of Laser Tattoo Removal, we include in the service the use of our dedicated cooling machine to assist in pain minimisation. Your comfort, your results, our priority. Our price starts at $99 and increases with the size and detail of the tattoo. We do not categorise all of our clients into a few vague size brackets, rather once in the clinic we customise a price based on your individual tattoo. Tattoos come in all shapes and sizes and pricing of each treatment is reflective of this. Just as not every tattoo is the same, the price of a laser tattoo removal service that gets you your desired results will vary accordingly. Our price per treatment is determined by the size of the tattoo to be removed and will be confirmed at consultation. We offer our clients a customised discount for the treatment of multiple tattoos and can guarantee competitive pricing for a high-quality service. Whether you’re looking to achieve sufficient lightning for the tattoo to be covered up by another artist, or want a complete removal, we’ll be able to help. In your free, initial consultation, you’ll be able to explain your goals to one of our skilled technicians, allowing us to tailor the treatment to ensure your complete satisfaction. Start a conversation with one of our team and find out how our professional technicians and state of the art technology can help you achieve the result you want. Get in touch with our Sydney clinic today on 1300 166 465 to find out more. 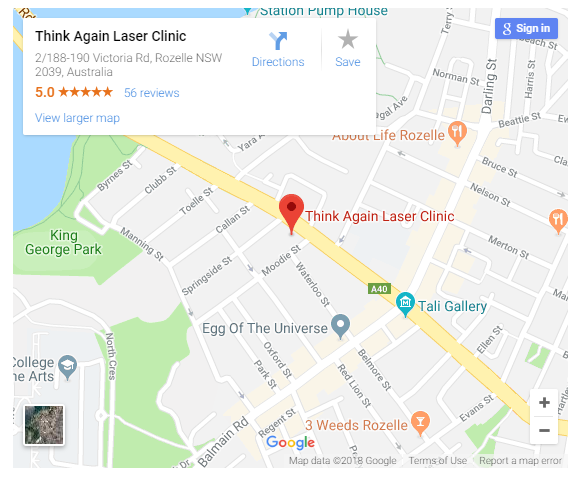 You can send us an email with your questions at info@thinkagainlaserclinic.com.au and we will be in touch to further discuss your requirements. Want to know why we are considered the best tattoo removal clinic? Get in touch With Us! Think Again Laser Clinic is here to help you! We only specialise in Tattoo removal so we can provide you with the service you deserve! Since tattoo removal is a process achieved over time you can be confident that our team at Think Again Laser Clinic will guide you on your journey to recreating the skin you’re in; a process that is likely to be far easier than you think. We look forward to meeting you and providing a Free Comprehensive Tattoo Analysis and Consultation.